The homogeneous vs heterogeneous contributions when using solid catalysts for the Suzuki-Miyaura coupling is still disputed. Leaching is often observed and quantified albeit with unclear conclusions about contributions of the leached species and of the solid catalyst to the global catalytic activity. 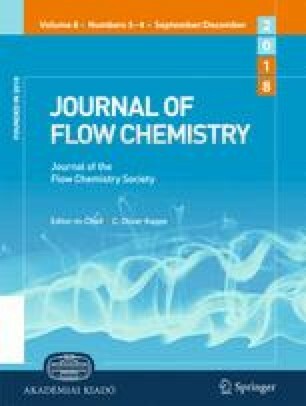 In this work, a new flow reactor design to discriminate both contributions is proposed. With the help of a simple reactor model, it has been possible to conclude that the coupling of 4-iodoacetophenone with phenylboronic acid proceeded with the leached homogeneous species only, whatever the solid Pd/silica used, whereas chloro-derivatives behaves differently. This reactor is simple to build and could be of general use to reveal actual heterogeneous vs homogeneous catalysis for many reactions. The online version of this article ( https://doi.org/10.1007/s41981-018-0020-7) contains supplementary material, which is available to authorized users. ED Chimie de Lyon is gratefully acknowledged for funding the PhD thesis of A. Bourouina. CNRS, CPE Lyon and UCBL are also thanked for financial support.